We are locally owned and operated with over 20 years of experience. Clean up your property or job site easily with our dumpsters. 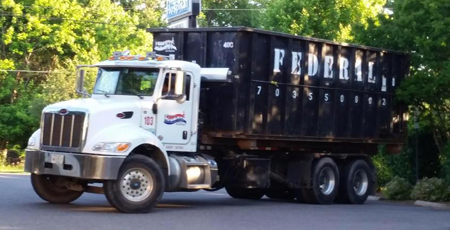 At Federal Roll-Off Services Inc. we provide dumpster rentals to help you complete your project. We also offer an alternative mini dumpster service, which is great for driveways or tight areas. 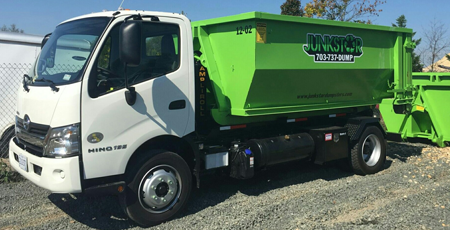 We use driveway friendly trucks to deliver and pick up the dumpsters. Learn about Federal Rolloff Services Inc.
Federal Roll-Off Services Inc. is an open top roll-off company that provides full waste disposal services for commercial, industrial, and residential clients in the Northern Virginia, District of Columbia, and Suburban Maryland areas. Our company is made up of a team of professional, reliable, and experienced drivers that can handle any size project you have. Each member of our team is courteous and professional, along with being drug tested and background checked. Whether you are a contractor, homeowner, landscaper, or service provider, our clean and reliable equipment, in addition to our prompt service, are sure to help you get the job done.